At first glance, Gizmos may look familiar. A heap of marbles gleam in the light, nestled in a funny cardboard contraption. 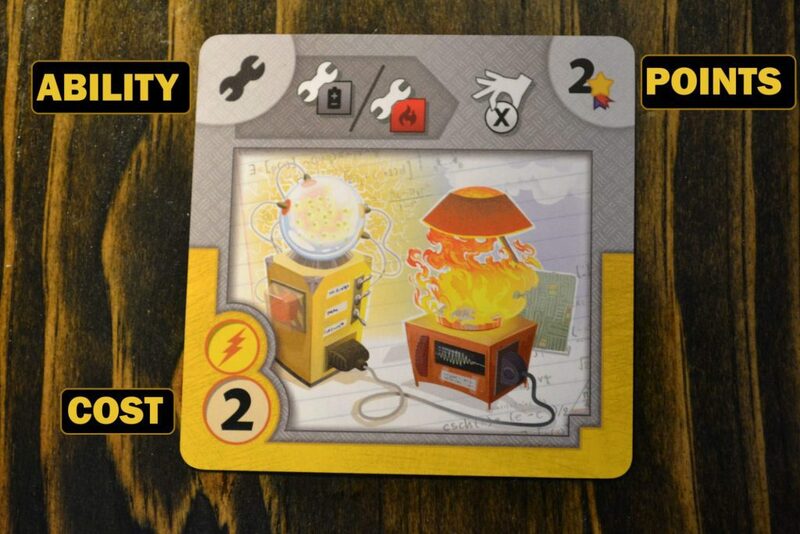 It’s hard not to think about Potion Explosion, another marble-loving c-c-c-combo game released by CMON in 2015. But in spite of a few structural familiarities, the two games couldn’t be more different. No, to understand where Gizmos fits in to the grand evolutionary tabletop tree, we have to take a closer look at how its gears spin. A price: This shows the amount and colour of marbles it costs to buy the card. A point value: Whoever gets the most points wins the game, so this is kinda important. An ability: There’s a lot going on with this one, but for now let’s just say most abilities make your actions more powerful. Pick: Take one of the six marbles currently available from the display area of the dispenser. Build: Choose one of the nine gizmo cards available for purchase, pay its cost in marbles, and add it to your collection. These cards are the source of points (and directly cause the end of the game) so this action is kind of important. Clockwise: The dispenser, card market, and player board(s). File: Reserve one of the nine cards available for purchase, tucking it away into your Archive. You can use a Build action on a later turn to purchase a card in your Archive. Research: This is a weird little action, because it’s really just a Build or File in disguise. Instead of taking a card from the central market, search through one of the three decks to find a card you like. Then, conduct a File or Build action for your chosen card. Gizmos wouldn’t be the wacky and magical romp that it is if it wasn’t for the constant allure of getting a sick combo, bro. Remember those abilities we talked about? They are, in many ways, the beating heart of this game. The key thing to understand is this: each and every gizmo has an ability, and in a very clever act of intentional design, each ability is triggered by a particular action type. Often, the card itself causes another action to occur. In a single turn you can end up triggering a huge swath of your gizmos. One of the smartest things about this game’s development is— and bear with me here because this is much more exciting than it sounds— its filing system. Every card you acquire gets carefully tucked underneath its corresponding action column on your player board. This means that at a glance, it’s so easy to tell when an ability triggers. This one happens when I Pick a blue marble. This one happens when I Build a gizmo I previously filed. And you’re constantly looking for opportunities to trigger that Rube Goldberg machine you’ve been stringing together the whole game: this lets me do that, which lets me do this, which lets me do THIS, HAHA! It’s intoxicating. Gizmos is a heck of a lot like Splendor, if Splendor had a zany baby with Dominion. I find it very fortunate that making big old combos is a definite path to victory, because playing Gizmos, I never want to do anything else. This is an example of a good design, in my eyes: the game actively encourages you to do the most fun thing you can. There’s a massive trough of marbles that sits at the table and dispenses the energy market. Spending marbles? Toss them in. Picking marbles? Choose one from the selection. Six marbles are always available for players to choose from, though a cheeky glance inside shows what’s coming up next. This system is impressive in the same way that a peacock’s mating ritual is impressive: certainly, it’s colourful. It’s quite something to watch. It does accomplish what it sets out to do. But perhaps the whole affair could have been accomplished a little more modestly— and take up a little less space in the process. The marble machine is effectively a randomization tool. It allows for a self-refilling market of available energy, and it has an interesting quirk of making recently spent resources less likely to pop up again. I like it, but it’s not necessary for the game to work. I suspect that CMON had a glut of marbles leftover from production of Potion Explosion and some clever person thought, hmm… that sounds like an opportunity. But the whole contraption is very playful, it’s sturdy, and it works well. I think only the most curmudgeonly of sticks-in-the-mud could object to its slightly showy charm. A player makes a payment from their energy storage area. Gizmos is a smart, fun game: it takes a couple tried and true concepts in engine building games and puts them all together in a slick package. A few key decisions made in Gizmos’ development have produced a game with a clear vision and good production. Easy to learn and play, Gizmos would make a good addition to any collection. Next postKing’s Forge Review – Craft Works!